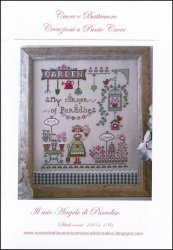 Il mio Angolo di Paradiso [D6350] - $12.22 : Yarn Tree, Your wholesale source for cross stitch supplies. Cross stitch chart from Cuore e Batticuore. A young woman tending to her garden. In her little corner of paradise you will find, garden tools hanging from a sign, decorative pots with bulbs blooming, a bed of flowers, and ivy trailing down a bird cage. Stitch count 160 x 186. Stitched on #8681 Belfast Linen antique ivory. This was an exclusive design for the 2016 Nashville Needlework Show.